So we have now finished work and I must say that we are both glad to be on the road again! The big news is that we have managed to buy ourselves a camper van to live and travel in for the rest of our time in OZ. It is a Toyota Hi-ace and used to be a mini-bus for Queensland government. The English couple that we brought her off had put a queen-size bed in the back that rolls away in to a sofa with plenty of storage space underneath. The van also came with all the camping extras that we needed, cooking stuff, camp stove, table and chairs etc. We collected her on Xmas eve and have named her Holly the Hiace. We've brought a few extras, boxes for storage a gazebo to put up by the side and a much needed stereo. With the van all checked over by the WA government, an inspection needed so that we could register with WA number plates, we were off on our 3000kms round road trip to Exmouth in Northern WA. Our fist stop after 6 hours of driving was to spend a night in Geraldton the Mid-West's biggest city on the Bratavia coast. We managed to find a campsite and then had a look around the town, which reminded us of stepping back in time very similar to the American Mid-west. WE sat by the beach and then brought a freshly cooked Western Rock lobster to have with our tea from the local fishing wharf. The following day we made it to the Western Australia Museum which was really interesting and had a main exhibition on the major shipwrecks that have occurred on the Bratavia coast since the 1600's there were also displays on the mid west and also one on the Aboriginal tribes of the area. We drove on again for about 5 hours with a few stops at roadhouses on the way, including Billabong. The roadhouses are spread out about every 150kms you can grad some food and drink and have a break form the driving. The area had got very barren and the soil had started to turn quite red. We stopped at a town called Carnarvon at about 7pm, by the time we had a arrived the campsite office was closed so we just parked up and plugged in to the electricity after having a camp curry we went to sleep and left early in the morning, the office was still shut and we drove away with a free night behind us. After only 4 hours of driving (a short stint) we arrived at Coral Bay, a very small place with about 8 shops 2 campsites and a hotel (with bar). The beach was amazing a small cove with white sand and turquoise waters. We parked the van up at the campsite and spent the afternoon on the beach snorkeling among the big Red Emperor fish. The following day we had organised to take a glass bottom boat out over Ningaloo Reef to spot turtles in their natural environment. The water was so clear that we could see the reef as it was so shallow and there were loads of fish species swimming underneath us. We made it out over reef and were then on the lookout for Loggerhead turtles, not long after we had slowed up one of the crew spotted one poking its head out of the water everyone jumped up to have a look. We were really lucky to see about 20 turtles gliding under the water occasionally popping their heads up for breath and to say hello. It was quite amusing as soon as someone saw one the skipper tried to head towards it so that we could all get a better look then someone else would shout that there was another turtle in the other direction, think he got quite confused in the end! We stopped at a couple of spots for snorkeling and as we had invested in a new underwater digital camera we jumped in pretty quick. 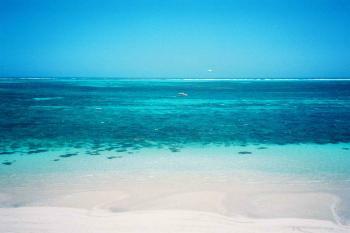 The reef is pretty unspoilt and some say better than the great barrier reef. Our next stop was Exmouth a town about an hour and half North of Coral Bay, still part of the Ningaloo reef.We drove through the centre straight to Budegi Beach to have a look around here we passed the Naval Communications base which the town had been built around. We also spotted a few Emus wandering around at the side of the road.The beach was lovely and wide although we did not stop for long as we wanted to find a campsite and visit the tourist information centre to find out the places to visit. We ended up chilling out by the campsites pool and then driving on to the marina for some fishing.We then made a drive up to the top of the cape and the Vlamingh lighthouse to watch the sunset over the sea, as it had been a clear day it was lovely to watch the sun disappear over the ocean. The next day we drove again up to the tip of the cape, but carried on in to the Cape Range National Park.We stopped at the visitor centre to see if there was anymore information we could pick up, but we had been given more detailed info at the main tourist centre, although we did find out which beaches we would be able to fish of off.We decided that we wanted to go as far as Osprey bay a good 40km drive so we thought we would start there and work our way back to all the other places we wanted to see.Osprey bay was a good start nearly deserted, a place Wayne could fish, blue sea, turtles close to the shore and also our first up close sighting of a wild joey! The next stop was Sandy bay which was popular with wind surfers, it looked as though it was a good day for it as the surfers whipped their boats around in the wind and were gliding through the air for several meters.We stopped at a few smaller beaches for a spot of fishing and then on to Oyster stacks along the way we spotted some large birds of prey, some wild horses and also took in the scenery of the limestone ranges with some gorges running through.The land from the range to the coast was quite barren with a bit of scrubland where we spotted a few kangaroos hopping along.Oyster Stacks had no beach and the rocks jutted straight in to the clear sea.This was supposed to be a top spot for snorkeling, we were not that keen on getting in the water as we saw a few shadows moving around close to the shore, we think these were rays and turtles, but were not 100% sure.Our next stop was Turquoise Bay, the most picturesque and popular, a good spot for swimming and snorkeling.It was really hot about 38 degrees b we did manage to relax on the beach for an hour. There were lots of families around and one boy came running out of water as he was not sure what was in there, he then went slowly back in to investigate, it turned out it was a little reef shark swimming in the shallows. We think that the shadow in the water at Oyster Stacks may have been another reef shark!One of our final stops in the park was Lakeside sanctuary, which had a small camping area a small lake and then a long beach.Wayne got the fishing rod out here and we moved along the beach stopping in different places.We did not catch a thing but saw 2 rays swimming close to the shore and when we got back to the van we spotted 3 kangaroos by the side of the lake.We drove back up past the lighthouse towards the town and stopped off on the northern tip of the cape to see the wreck of the SS Mildura, a cattle boat which hit the reef and sank very close to the shore, the rusting boat can be seen clearly. Once back in the town we headed for the marina for some fishing apparently there had been some good size fish pulled out lately and also some squid.We caught nothing again! The whole area was being extensively developed new houses being built around a new area of man made marina. On our third day in Exmouth it was my birthday and the temperature hit, 48 degrees, extremely hot and really it was too hot to do much at all.We took a drive around to the beaches before the national park so that Wayne could try out some of his fishing equipment, it was nice to just relax on the beach with no one else in sight.We also went to visit some powder white sand dunes that we had seen the previous day, the breeze on the Western side of the cape was much cooler so we sat and watched the waves for a little while with the dunes behind us and again not another sole on the beach, it was really peaceful.As the temperature soared we decided to go to the shade of a cafe and then on to Town Beach as the breeze had changed and so it was now cooler on the Eastern side.We decided to give up on the beach as this was not one of the best and Wayne still had not caught a fish, we instead headed back to the swimming pool, which was lovely and cool for a late afternoon dip.The pool overlooked a small Italian restaurant called Pinocchio's, we had a lovely meal on their terrace with the pool illuminated with fairy lights.The restaurant was quite busy probably because the food was so good, Wayne had Chilli Mussels to start while I had a smoked salmon bruchetta, for my main I had a seafood pasta and Wayne had a T bone steak which he said was one of the most tender he had ever eaten!We washed it down with a bottle of warm Margaret River red that we had been given for Xmas, a lovely end to a nice day. The main highway that we had travelled along to get from Perth to Exmouth was really quite dry and nearly all of the rivers and creeks had dried out, the wide river beds that are left are dry cracked and pretty sad looking.It was even stranger when we first saw a sign advising us of a floodway, we both laughed it is impossible to imagine how there could be any flooding in an area so dry that all the large rivers and creeks are all dry. Also along the roads there were lots of signs warning us of the stray wild animals, just off of the main highway we saw sheep, cattle and hundreds of goats.On the drive back down from Exmouth we also spotted a large bird of prey, a lizard at the side of the road and Wayne also saw a snake glide across the road.